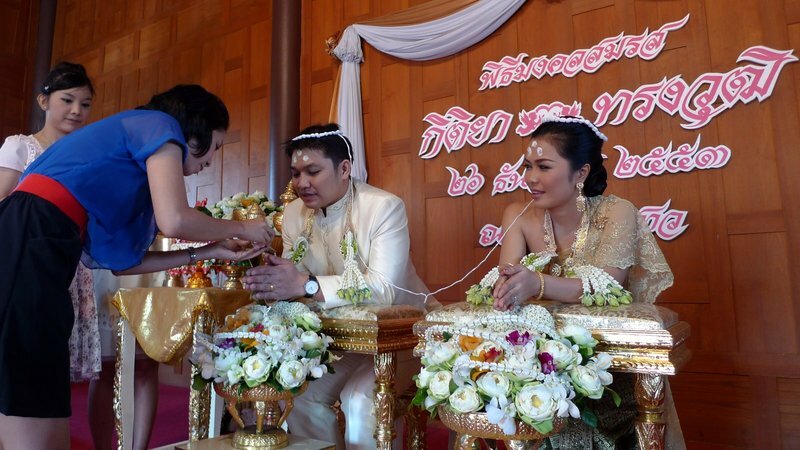 On the day after Christmas, my Thai teacher of the last four and a half years finally tied the knot. There’s no doubt she’s a patient person – continuing to tutor me after all these years is all the evidence of patience you would ever need – and her patience finally paid off as she married a handsome, decent, and loving man. Tawn and I were very honored to be invited to the ceremony and I thought I would share some of the photos with you. 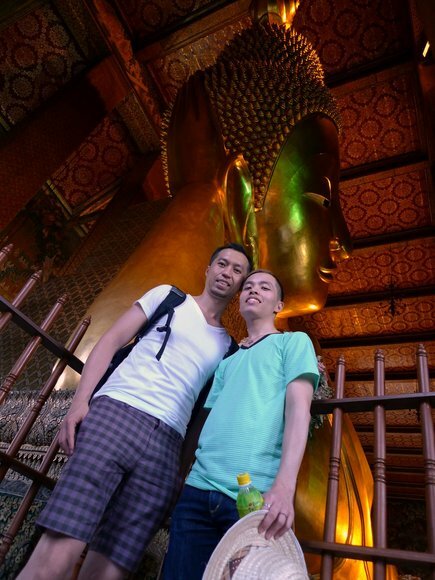 Above, photos of Khru Kitiya (“Khru” means “teacher” in Thai) and her husband, Khun Por. 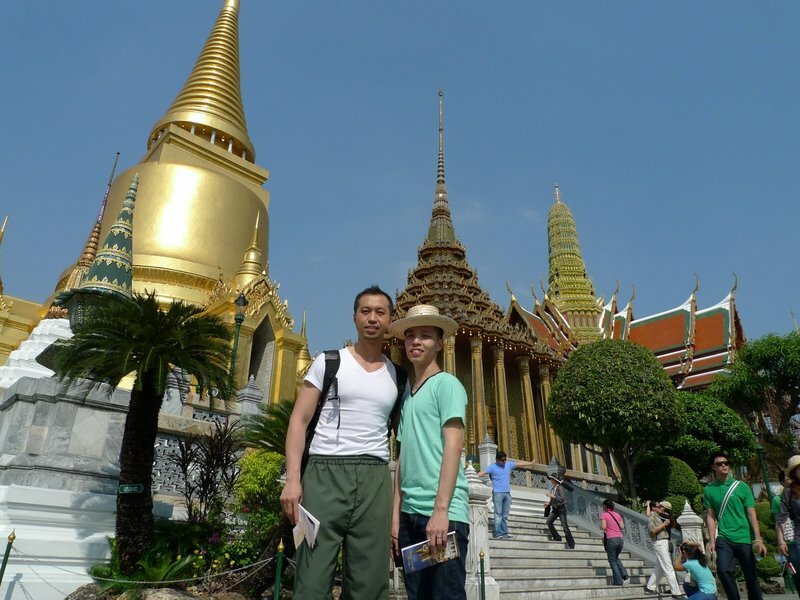 It is common for Thai couples to go for professional wedding portraits weeks or months in advance of their wedding. These portraits are often elaborately staged in specialized studios, many of which are located in our neighborhood. 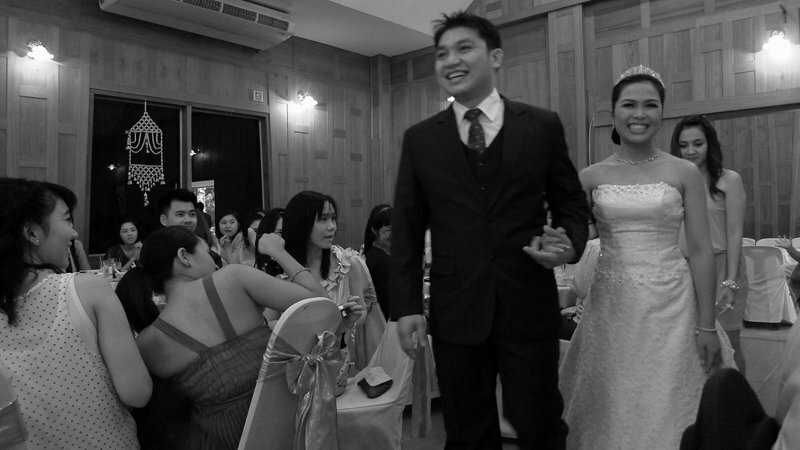 The photos are then displayed at the wedding reception for guests to enjoy. 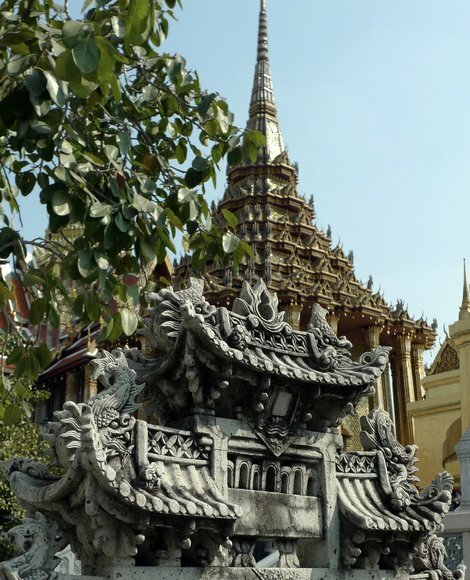 The wedding ceremonies were held at a facility on the north side of the city that is built in a traditional Thai style. This main building is part of a rooftop reception area with open-air pavilions on either side of the deck. Because it was a very bright day, although pleasantly breezy, most guests were hiding in the shade. 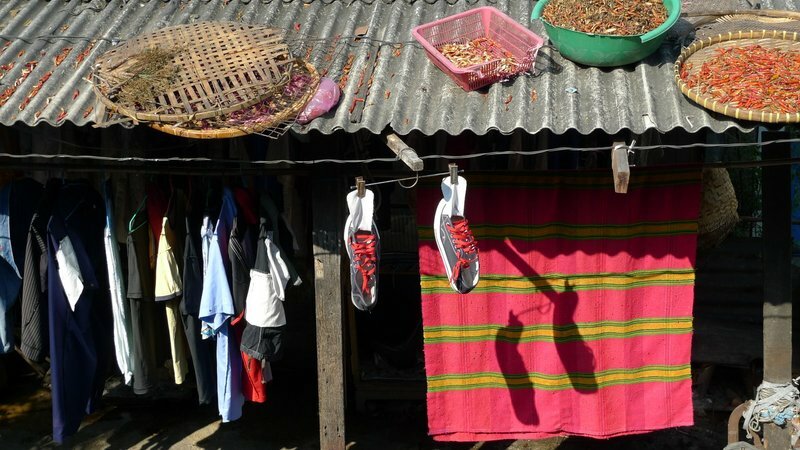 Notice all the shoes of the guests who are inside the main building. The day consisted of three distinct events, of which we took part in the second two. 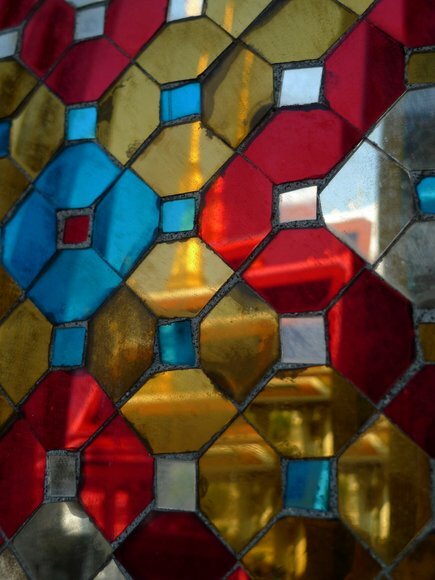 The first began at 7:30, when the monks arrived to conduct a traditional Buddhist ceremony, complete with chanting and the splashing of holy water. 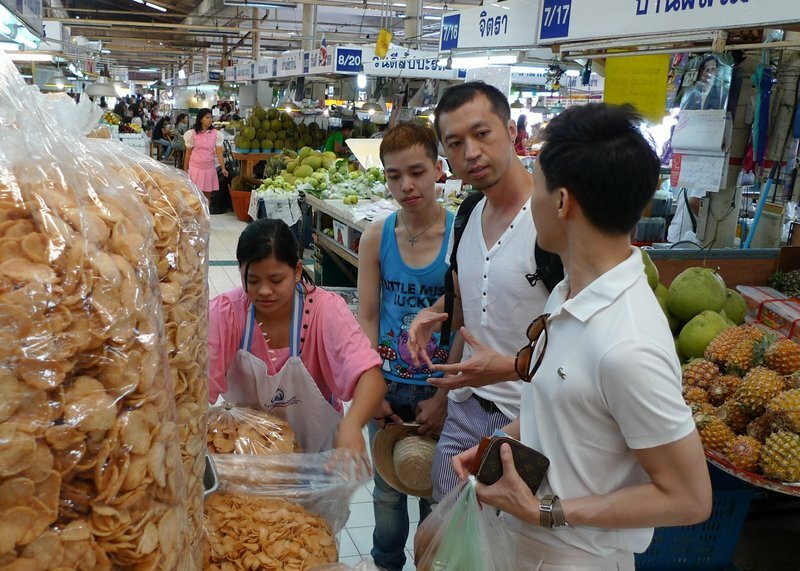 The families of the couple then feed the monks in order to make merit for the newlyweds. 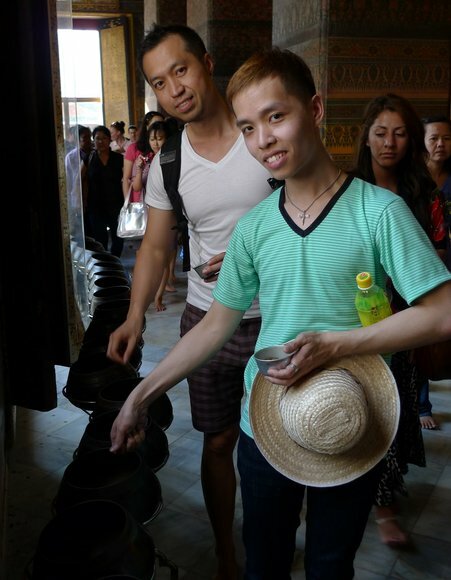 The second event was the Rot Nam (“water pouring”) ceremony. Family members and friends bless the groom and bride by pouring a small amount of water on their hands, which are held in a prayer-like position, while wishing them happiness in their marriage. You will notice that both the groom and bride are in more traditional outfits, symbolically joined by a string, and have additional blessing marks on their foreheads. The third event was a Chinese style luncheon banquet, held downstairs from the pavilions. 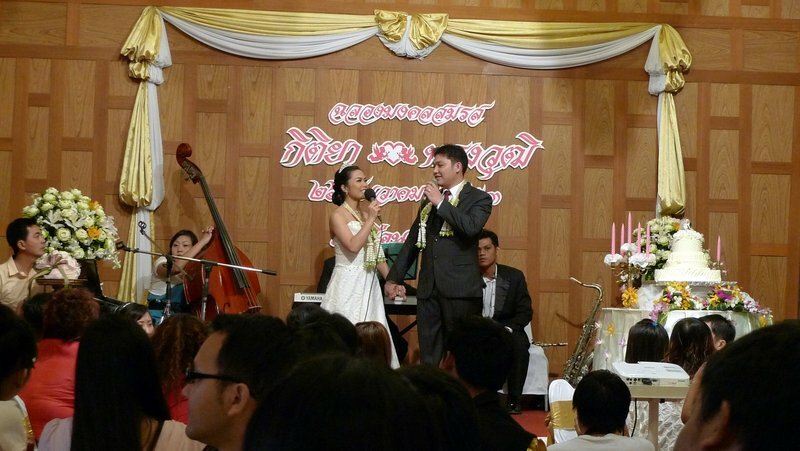 There were probably 200 guests and we enjoyed dish after dish of tasty food while listening to speeches by Phuu Yai (“big people”, or guests of honor) and teasing by the two masters of ceremonies. One special treat after the speeches was that Khun Por and Khru Kitiya performed a duet for the guests. 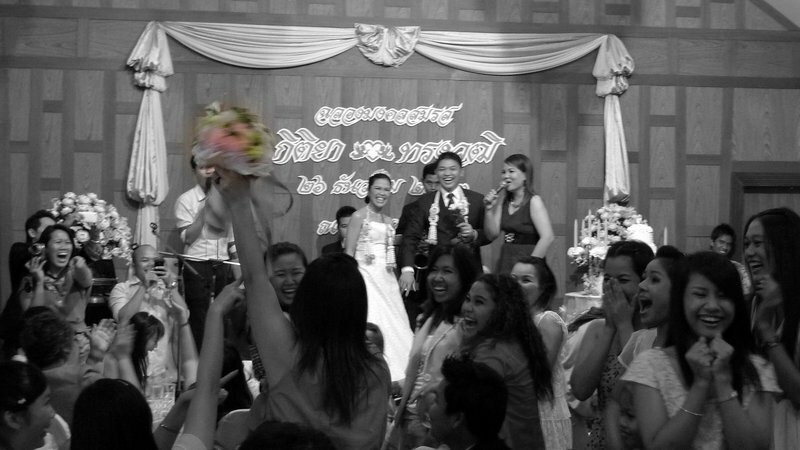 Singing in front of a crowd is always a little scary but doing that on your wedding day just raises the stakes! 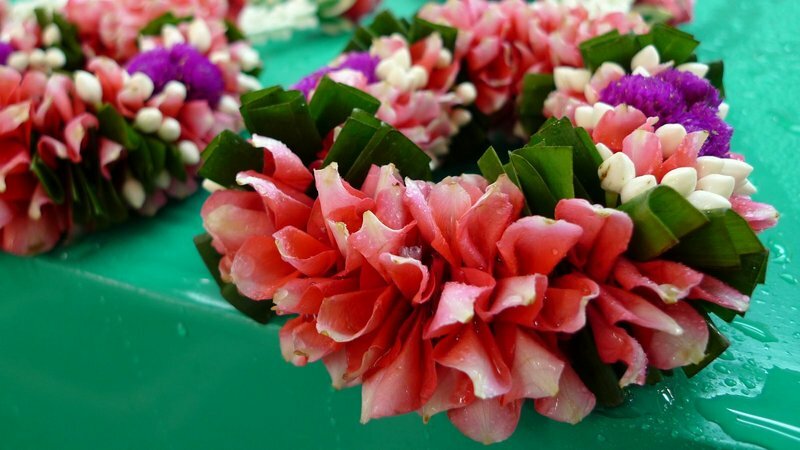 After the cake was cut, Khru Kitiya did something unconventional for a Thai wedding: she threw her bouquet to the crowd of unmarried women. 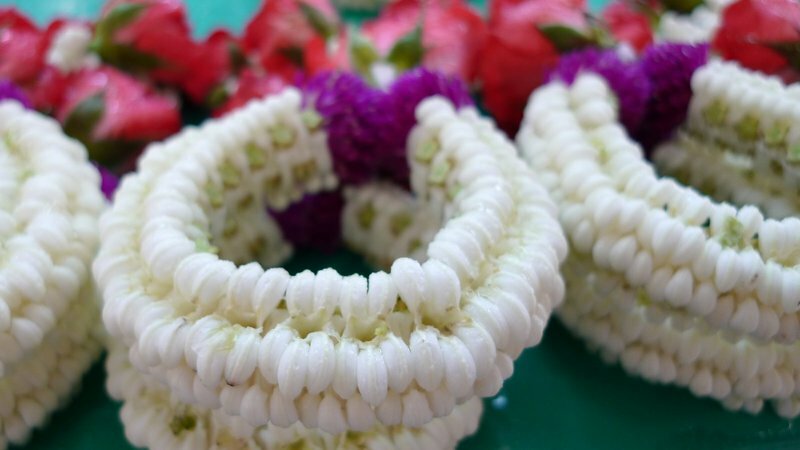 This is something borrowed from American style weddings and I’ve never seen it at a Thai wedding before. Unfortunately, her aim was a bit wide and the bouquet ended up in the hands of a young lady, recently married and expecting her first child! It was a very fun celebration and we were glad to have been invited to be a part of it. 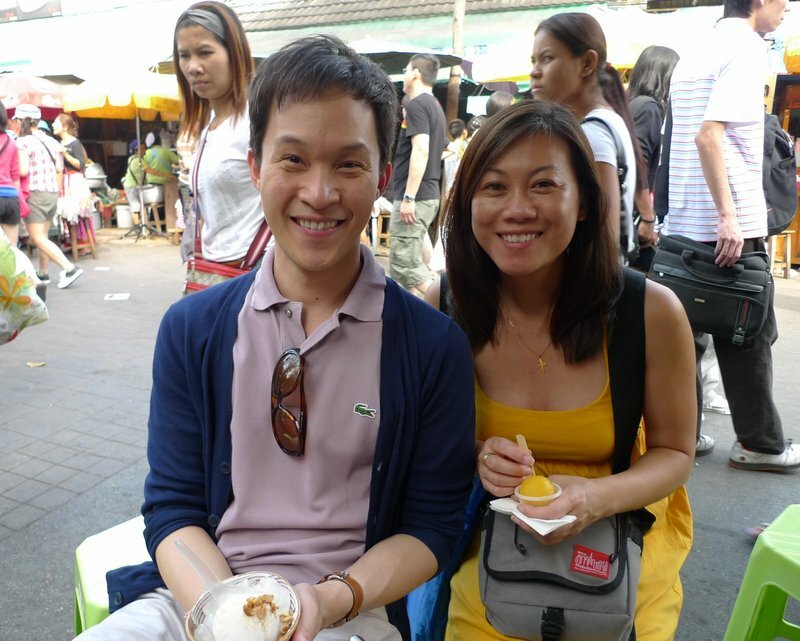 I hope Khun Por and Khru Kitiya have a long and happy life together! A year ago Christmas day I received my provisional Thai Driver’s License. 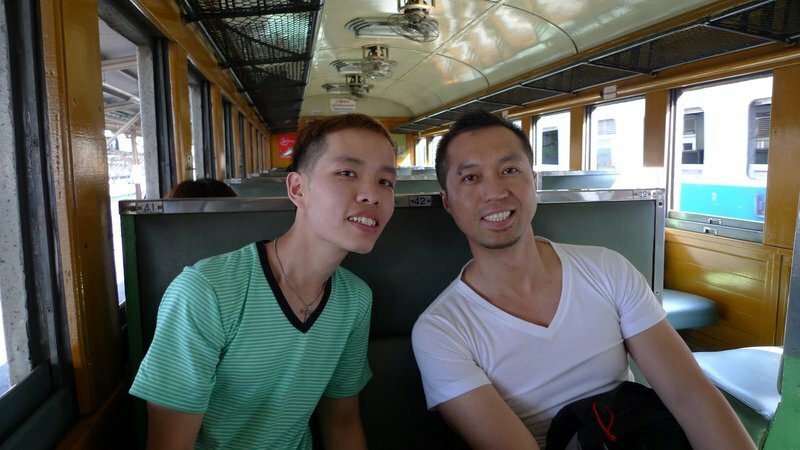 Provisional means it was only good for a year, so as Santa left for points west and Boxing Day dawned on Wat Arun, I was faced with another trip to the Department of Land Transport (DLT) to renew my license. Many farang (foreigners) ask why I bother getting a license. 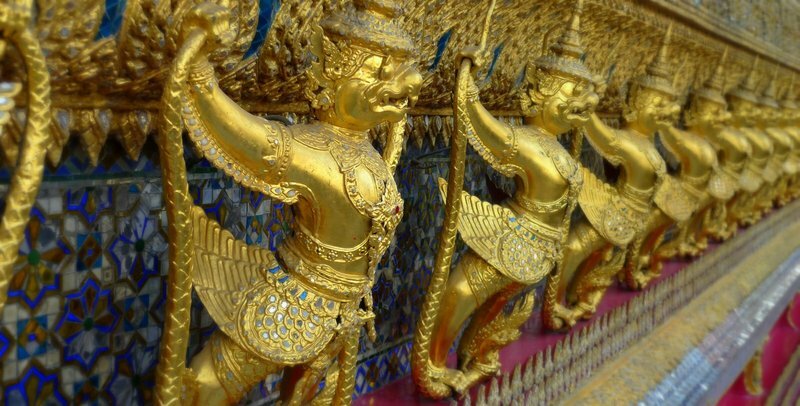 While the vast majority probably are smart enough to leave the driving to others, untold numbers of farang drive about the Kingdom with nothing more than their International Driver’s License, or even less. I, however, wanted to make the effort to follow the law and have my license if I was going to continue taking on the traffic-choked byways of the City of Angels from behind the wheel. Heading to the DLT on the last Monday of the year was not the wisest choice. I spent a half-hour orbiting the parking lot searching for a place to park. The chaos there – traffic going every which way, regardless of the painted stripes and arrows – was like a driving examination writ large, and nearly everyone seemed to be failing. Finally, as my bladder strongly suggested it might be best to abort the mission, a spot opened before me, one with blessed shade. The process of getting a driver’s license at the DLT is more painless than you might expect. Even if I didn’t speak a fair amount of Thai, I would still have been able to work through the steps without the assistance of a native. The main counter on the second floor is staffed by friendly employees who review your documents and there is an English language list of what is required, should you be missing anything. Ad hoc photocopy vendors are in the hallway to take care of any last-minute copying needs so as long as you have all your documents with you, you will be in good shape. 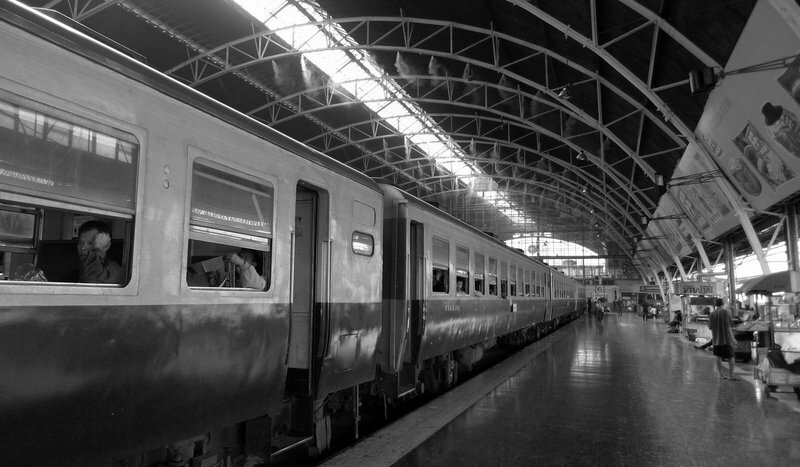 Alas, I was ill-prepared and arrived at the DLT without a medical certificate stating that I was free from whatever diseases would prevent me from the safe operation of motor vehicles. Drat. A trip to my local hospital and a return to the DLT would consume the rest of the day. Cannily, I asked whether there was a clinic nearby. Certainly, replied the friendly staff member. Downstairs in the motorcycle department. Or, at least that is what I understood. 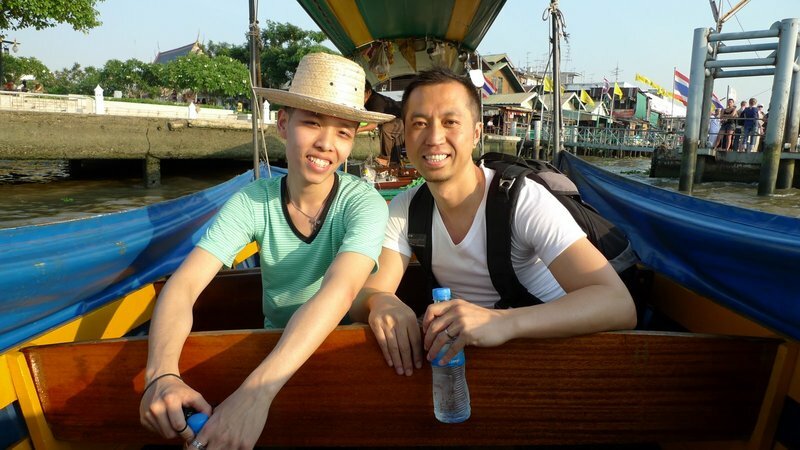 This tale illustrates how knowing not quite enough Thai can be a challenge. I went downstairs and read a sign that I thought said “medical inspections” but which, upon later reflection, must not have said that. Asking at what, in my vision of the world, was the medical inspections counter, another nice lady gracefully cleared up my confusion and explained that the nearest clinic was on the main street and to the left at the first traffic light. Or, at least that is what I understood. 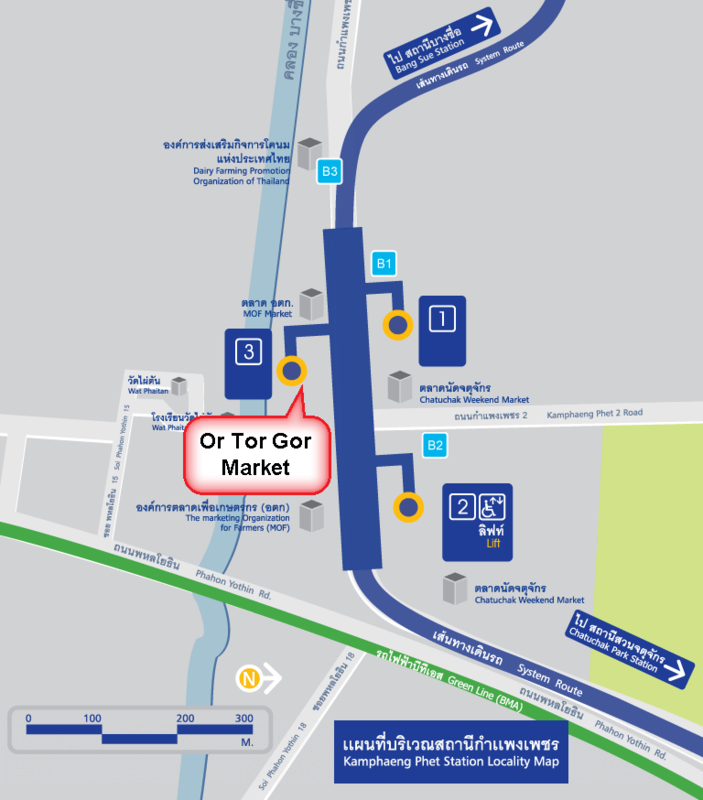 As I traipsed the considerable distance back to Paholyothin Road, avoiding the drivers still participating in the parking lot-wide driving exam, I wondered whether I had misunderstood a second time. My confidence was boosted at the traffic light, though, when I made out the words “clinic” on a sign board and walked past a broken down photocopy machine and into the pale green interior of a small shop house. Sure enough, for 100 baht a woman of unknown medical experience will listen to your breathing with a stethoscope and then sign a medical certificate clearing you to drive. No, I have no idea what she was checking but presumably she heard my heart beating. Have pulse, can drive. Once I returned to Building Four, Floor Two of the DLT with the medical certificate in hand, the process was head-spinningly fast. While Thais have several dozen counters at which to be helped, we farang have two cubicles at the far end of the room that have been set aside for foreigners. Thais may find this unfair, but I figure it is just desserts for the double priced admission I have to pay at Calypso Cabaret, even though I’m a resident foreigner. Within ten minutes of entering cubicle 18, I exited with my very own five-year Thai Driver’s License. After all the hassle of getting there, finding parking, and locating a clinic for a thorough medical examination, the actual bureaucratic process of filling out forms, taking a picture, and printing a new license took all of ten minutes. 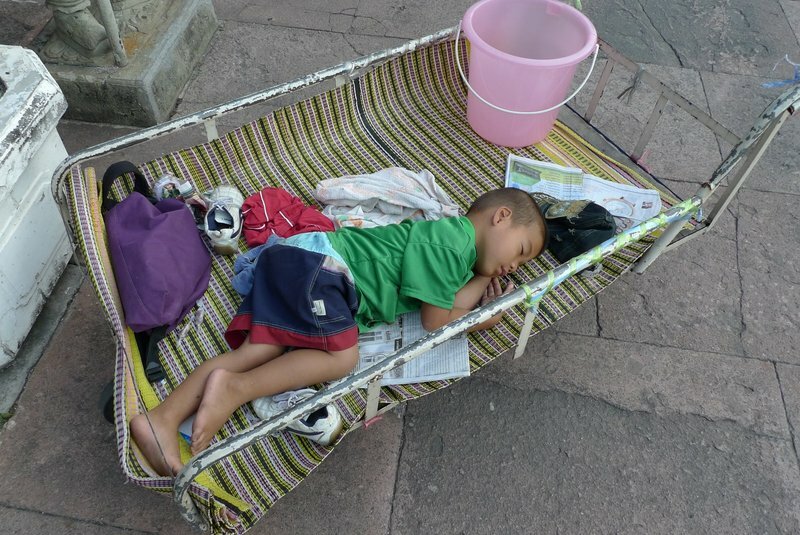 As I pulled out of my still-shady parking space, I marveled at how easy it can sometimes be to do the right thing and follow all the steps required by the Thai government of farangs living and working here. And then just as my car reached the exit, two taxis ahead of me had a small fender-bender. The drivers exited their cars and spent several minutes arguing over the imperceptible damage to their vehicles, unaware of the line of blocked cars behind them growing longer. As the Skytrain glided by overhead, I put the car in park and snuck another look at my picture, grinning back from under the laminate of my new driver’s license. Weeks ago, a group of Tawn’s university friends conspired to hold their holiday dinner on Christmas Eve. “It’s a potluck,” they said. “Everyone should bring something!” For whatever reason, I decided a lasagna would be a nice addition to the eclectic mix of food. And as the party crept closer, I was possessed with the idea of making the lasagna from scratch. My uncle’s mother-in-law makes the best lasagna, a recipe-less dish with a meaty sauce and lots of gooey mozzarella cheese. 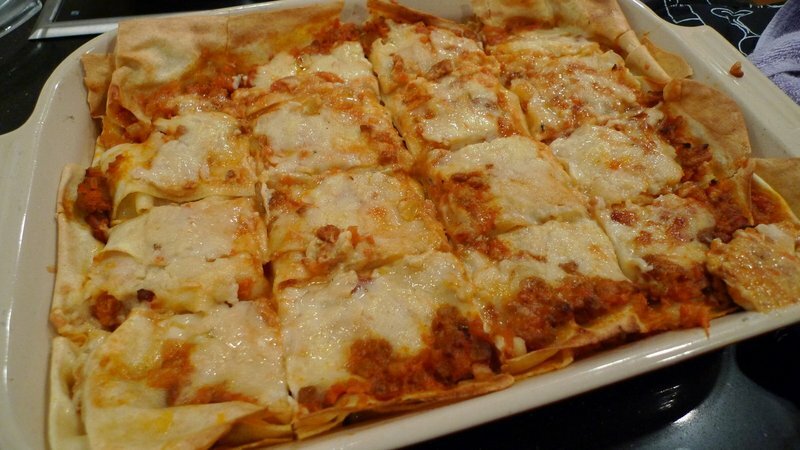 Since there is no recipe from which to work, I turned my attention to various online resources, settling (kind of) on a recipe from fxcuisine.com for Lasagna Bolognese. 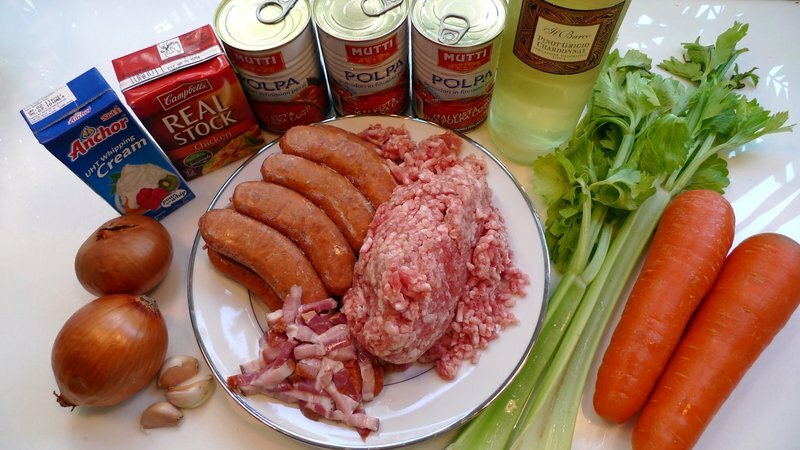 The process was two-part: The first part was to make a hearty ragù in the traditional style of Bologna, Italy. 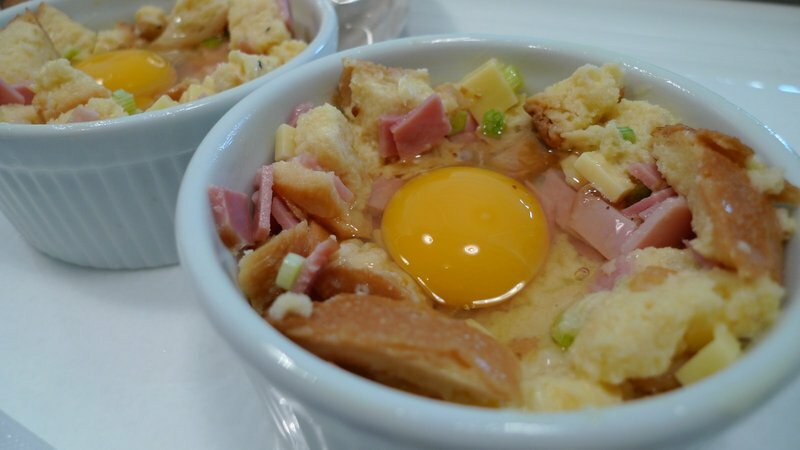 This recipe is based one one written by two legendary Bologna home chefs, sisters Margherita and Valeria Simili, from their book Sfida al Matterello. 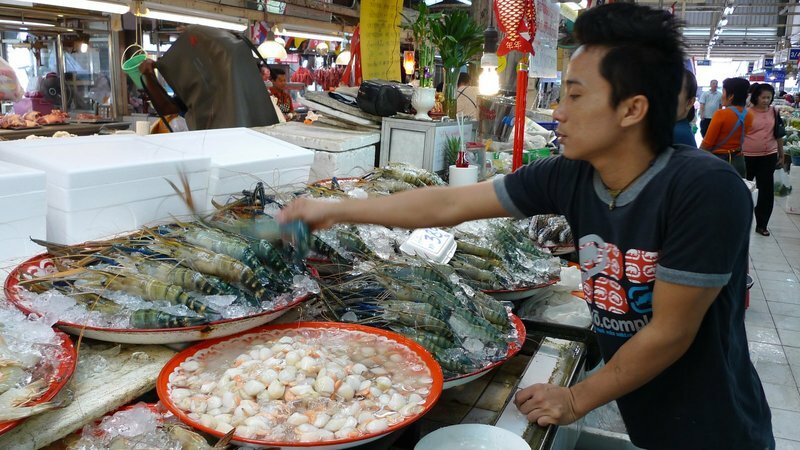 I found it presented in exacting detail on fxcuisine.com. 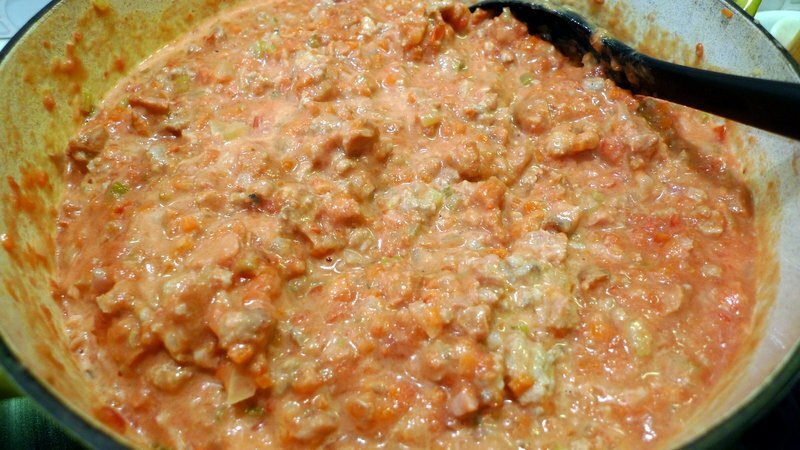 It uses both butter and oil, pancetta or parma ham, a mixture of beef and pork shoulder, puréed tomatoes, onions, garlic, carrot, celery, chicken livers, dry white wine, milk, chicken stock, and salt, pepper, and nutmeg to taste. Reviewing my picture, you will notice that I made some substitutions. The meat is just ground pork and spicy Italian sausage (which I removed from the casing), instead of the beef and pork shoulder mixture. The chicken livers have been removed but I did substitute an anchovy fillet. 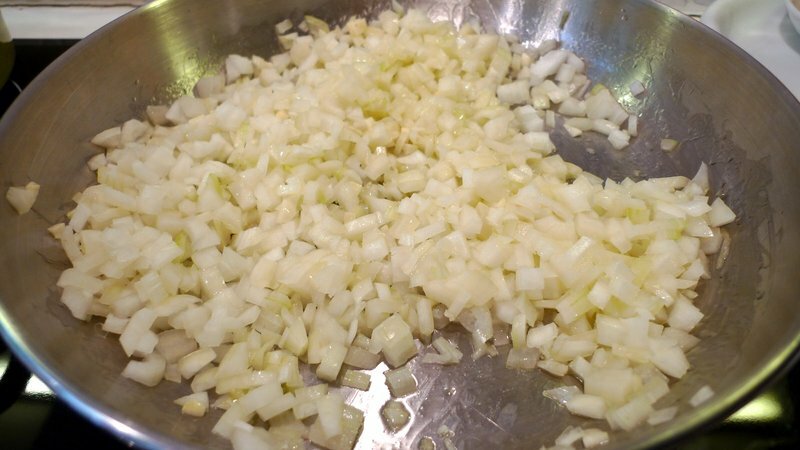 The first step after prepping all your vegetables and other ingredients, is to sauté the onions until soft but not browned. This is done in a mixture of oil and butter. 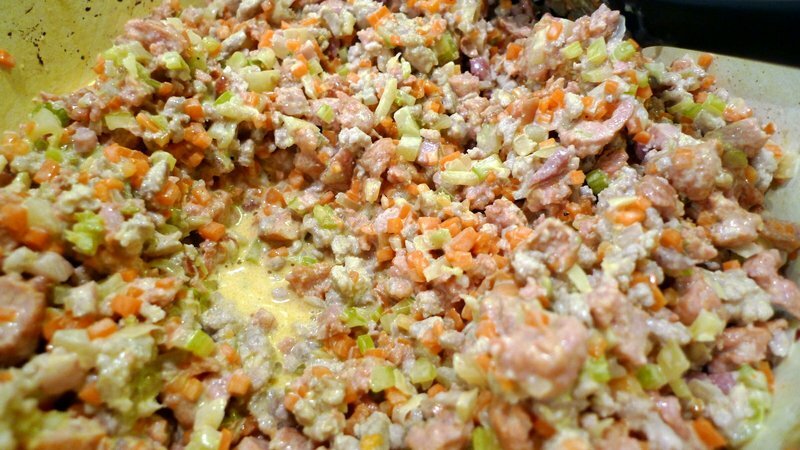 Add the carrots and celery and sauté further until they start to brown. Add the pancetta. 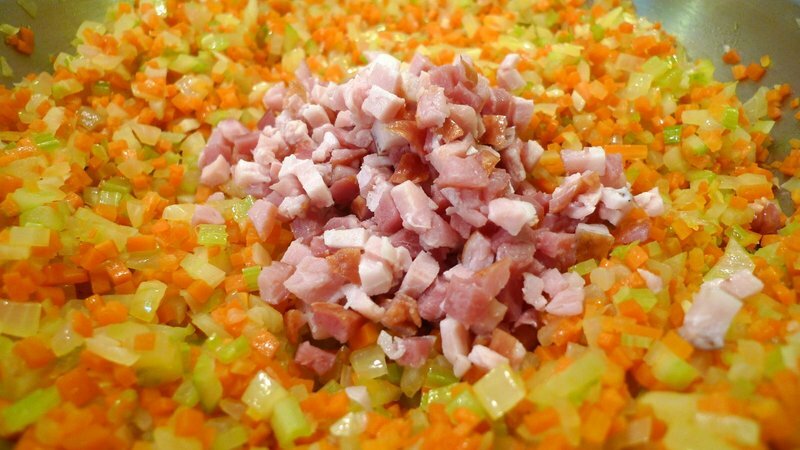 You can also use Parma ham or good quality dried bacon, finely diced. 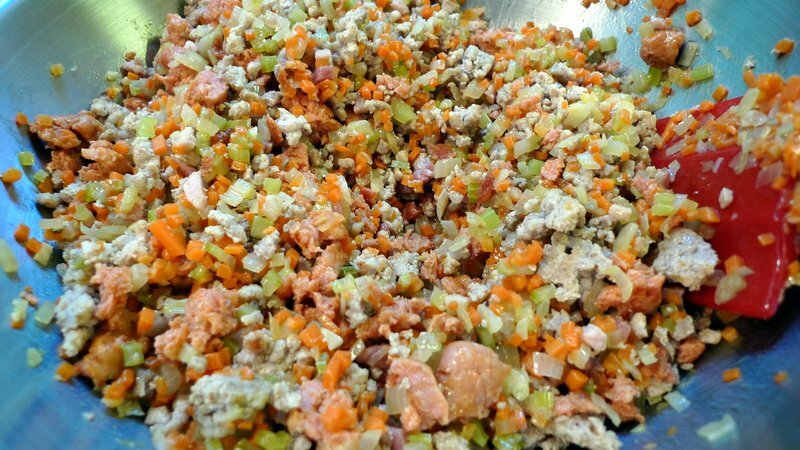 In lieu of chicken livers, of which you use only one or two for a more meaty flavor, I diced one anchovy fillet and added it to the onion, carrot, celery, pancetta mixture. While I would have preferred to stick with the chicken liver as per the original recipe, one must accommodate one’s spouse’s preferences. This is the secret to a happy marriage. After removing the aromatics to a bowl, I browned the ground pork and sausage in small batches. A key to browning meat is to not crowd the pan, otherwise you steam it more than brown it. 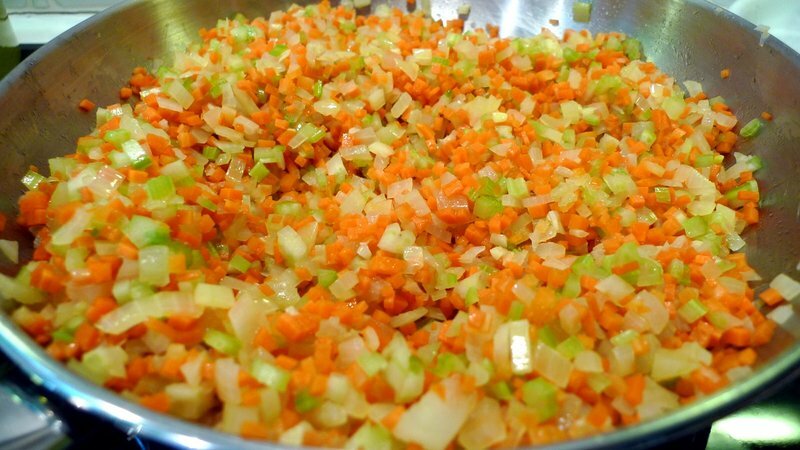 As each batch finished browning, I added it to the bowl of aromatics. Finally, after all the meat was browned, I deglazed the pan with a bit of white wine. This simply means I scraped down the pan as the wine was boiling in order to remove all the tasty little caramelized bits that were stuck to the bottom. After the alcohol burned off – the point at which it stops smelling like boiling wine – I added the liquid and caramelized bits to the bowl of meat and aromatics. Switching cooking vessels, I placed the whole mixture in a large Dutch oven on medium heat and added the warmed milk. Actually, I used a combination of cream and milk, just for some additional richness since I used a leaner meat. 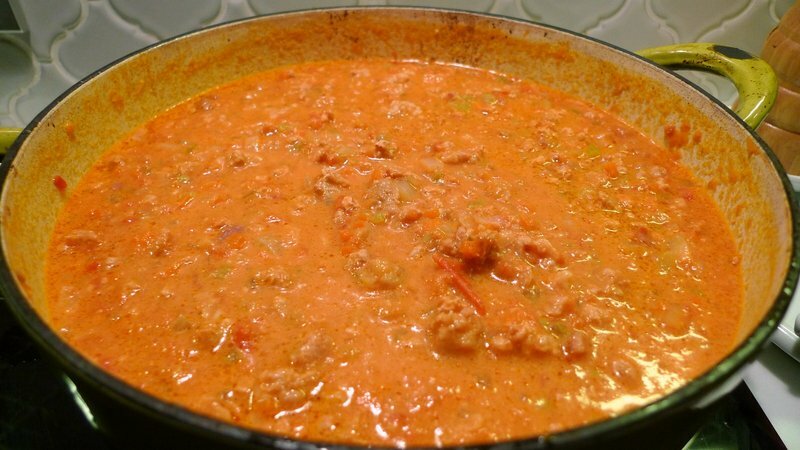 The milk adds a sweetness that softens the “meatiness” of the ragù. Once the meat mixture was boiling, I added some canned puréed tomatoes. 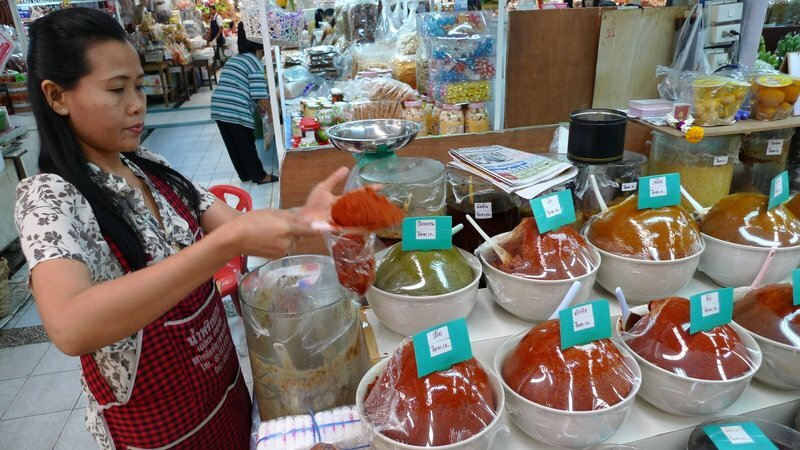 In my book, canned tomatoes still count as scratch because the tomatoes you can find here in Thailand just aren’t as rich and sweet and tomatoey as canned ones. To this is added some chicken stock. I also cheated and used boxed stock since the amount was small and not worth the effort to make stock from scratch. After this comes to a boil, reduce it to a simmer, cover tightly, and then let simmer for three to four hours. The result, after four hours, is a wonderful sauce. I let it cool and then refrigerated it for two nights before continuing with the second step of the process. 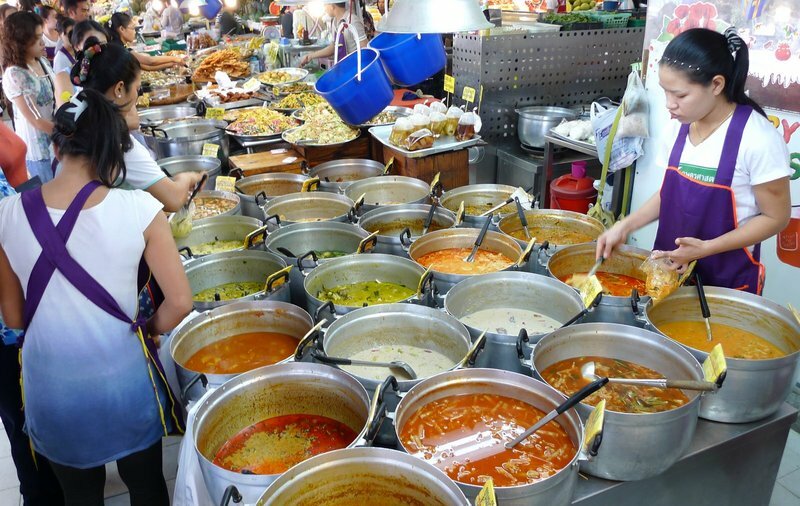 For some reason, sauces, stews, and ragùs benefit from some time to rest. The flavors mingle and become much more than the sum of their parts. 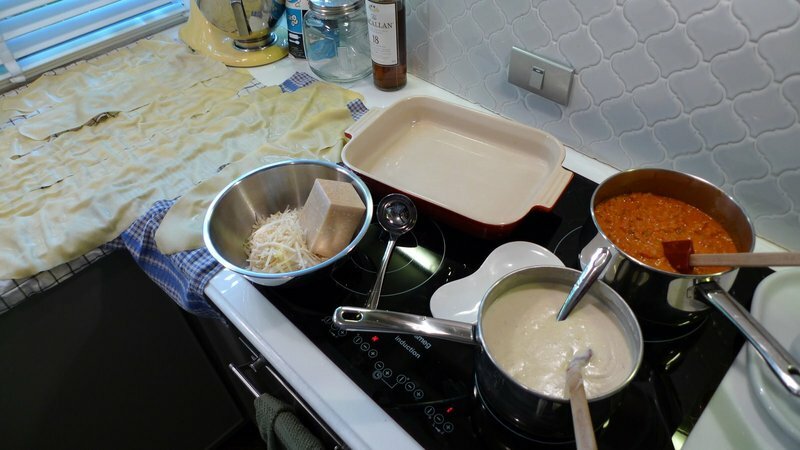 The second stage of the lasagna-making process was to make the pasta and assemble the lasagna. I opted to use a semolina flour pasta, which is a little more stable than one made with all-purpose flour. While I have made pasta from scratch two or three times, I don’t have a lot of experience. 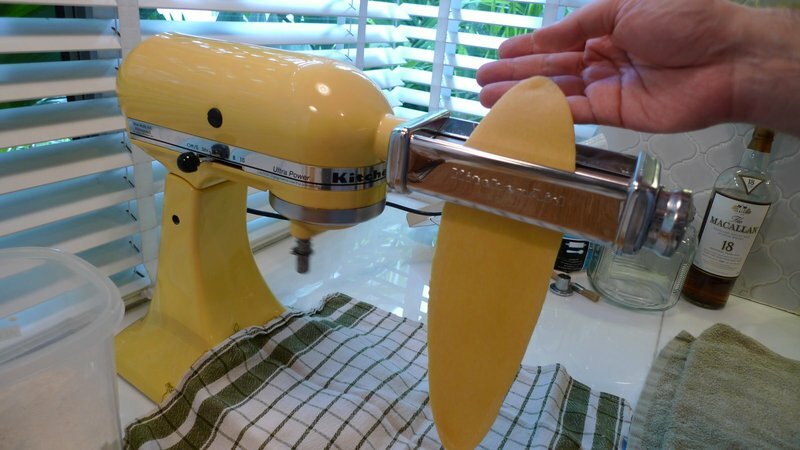 “Pasta making is easy!” people will tell you. While that is true, it is also a bit of a process and tends to require a bit of cleaning up, at least when you are inexperienced. Maybe if I practice more, pasta making will be less of a production. The ratio is easy: one large egg to every 100 grams of flour. I added a little pinch of salt and also a small splash of olive oil to make the dough a little more forgiving of me. 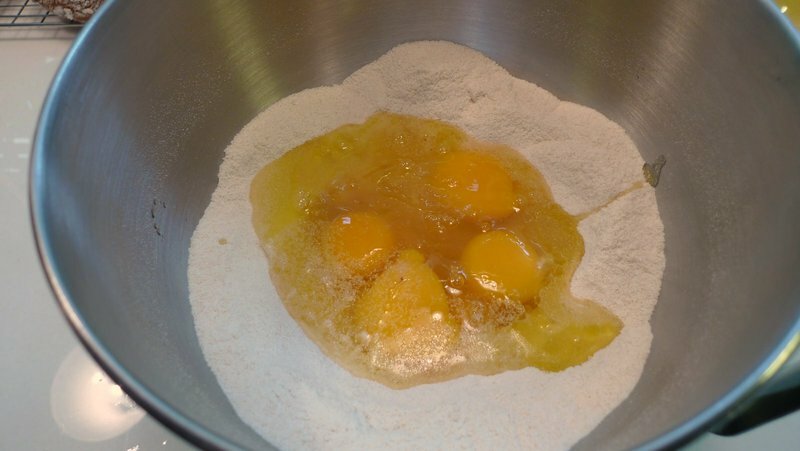 In this case, I used six eggs and 600 grams of flour, which makes a lot of pasta! I used the Kitchen Aid mixer to combine the dough, but it was pretty dry and my machine doesn’t have the strength necessary to knead it. 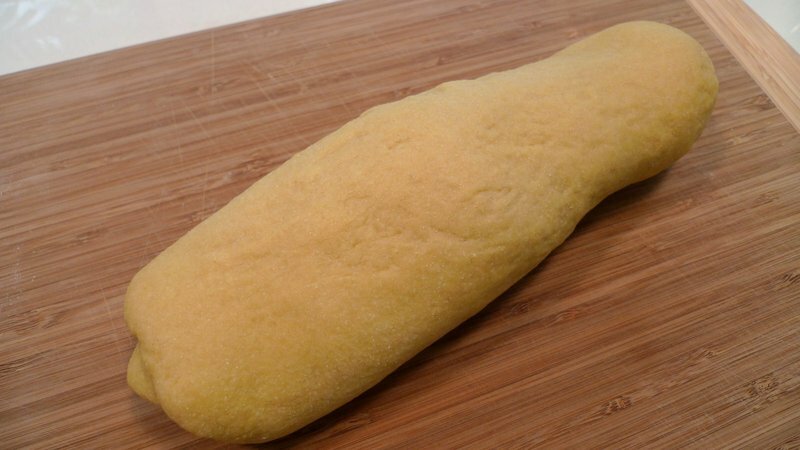 Desirous of Popeye-like forearms, I kneaded the dough myself for about ten minutes, until it became silky. Well, silkier. Then I let it rest in a plastic bag, refrigerated, for thirty minutes. While the pasta dough was snoozing, I made a Béchamel sauce. This is a really basic white sauce that is the foundation of macaroni and cheese. For this reason alone, everyone should learn how to make it. Here’s the formula: equal weights flour and butter. 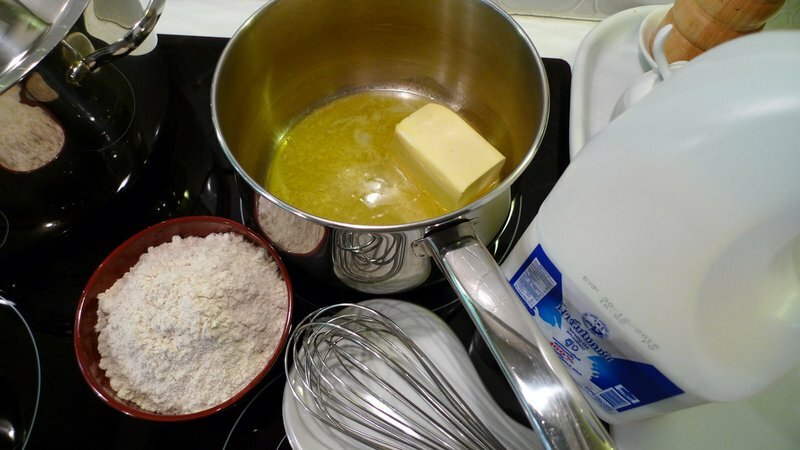 The process is equally simple: melt the butter, add the flour and whisk for a few minutes as the flour cooks. Then add the milk a little at a time, whisking until smooth and at the desired consistency. There was probably no good reason to make the sauce this early, but I know that once you start with the pasta-making process you need to be undistracted. I used discs of pasta dough about the size of a small lemon and passed them through the pasta roller until they reached the second-to-the-last setting, almost as thin as crèpes. Upon reflection, leaving them one setting thicker might have been better as lasagna is a hearty dish, calling for a hearty pasta. Here is the result of my work, drying on a well wiped-down clothes rack. 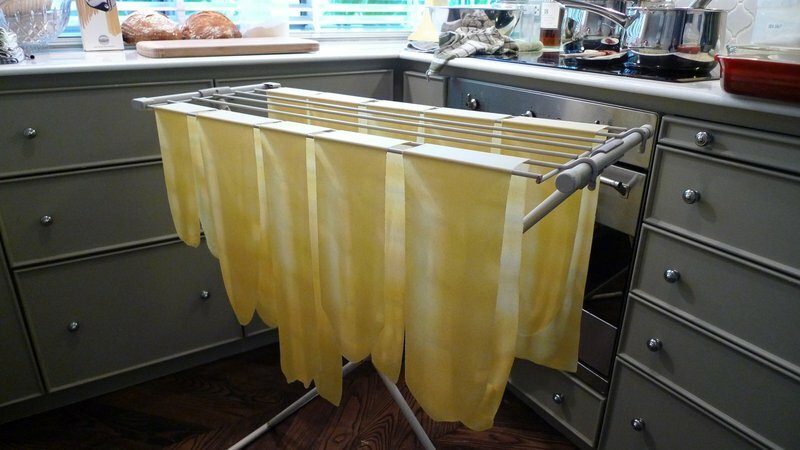 The problem is that the wires for the rack are too narrow, and my pasta sheets stuck to them. I had to be very careful when removing the pasta, lest they tear in half. You’ll notice the inconsistency in both sheet width and length, an illustration of how far I have to go before I am a pasta Jedi master. In case it looks like a lot of pasta, it is. This is enough pasta for three full-size lasagna dishes! 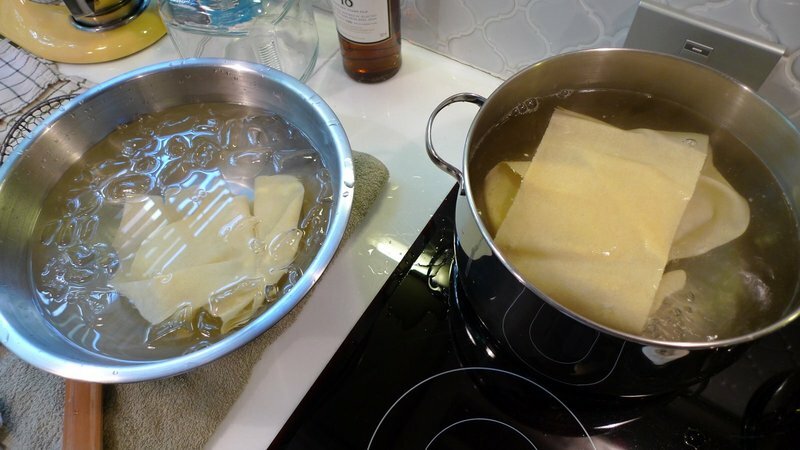 Using a large pot of boiling salted water and a large tub of ice water, I cooked the pasta sheets one at a time for about 30 seconds. 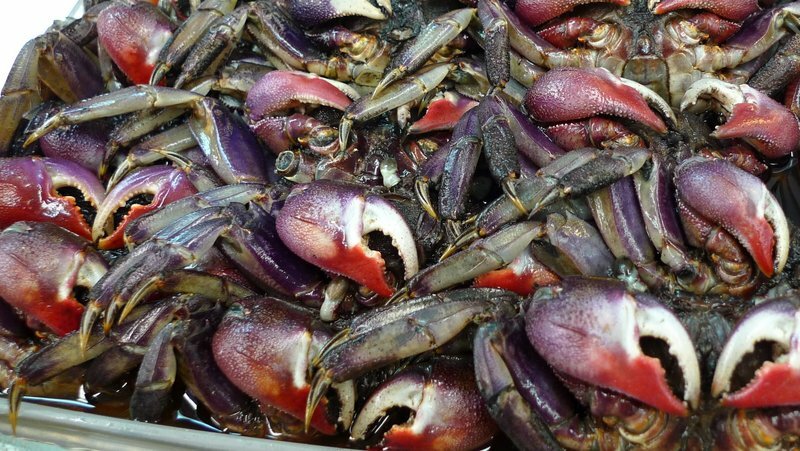 The idea isn’t to cook them to completion but to make them soft, flexible, and generally more stable to handle. 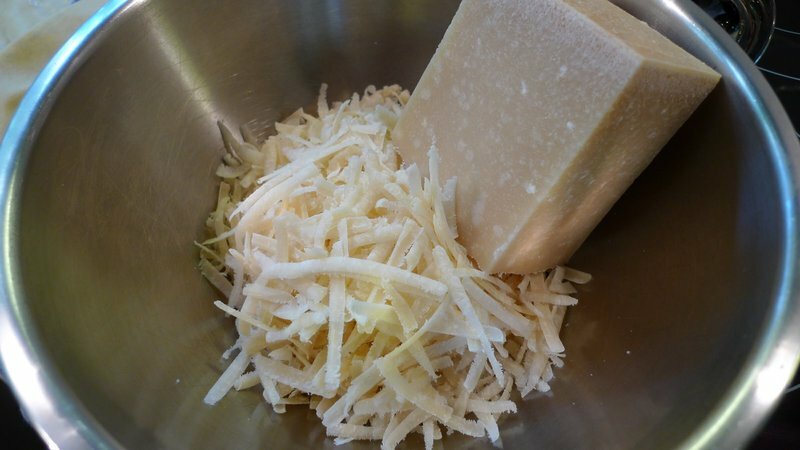 Before assembly, grate the high-quality Parmesan Reggiano cheese. No mozzarella in this recipe. I have to say, it is actually very nice without the mozzarella. 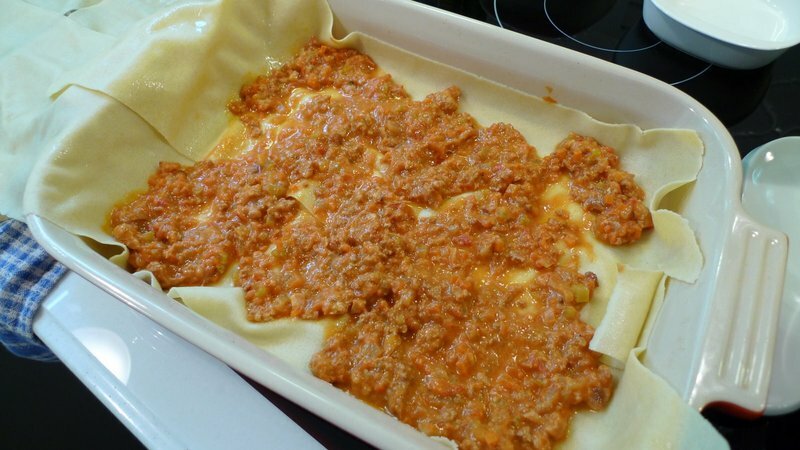 I think Americans have learned to expect that their lasagna will be gooey. Time for mass re-education. Okay, we’re ready to assemble. 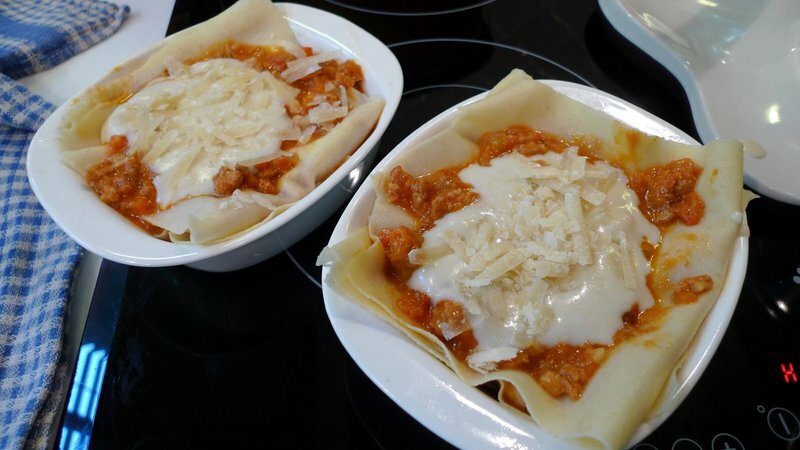 Pasta sheets are on tea towels, Béchamel sauce and ragù are warm but not bubbling, and the cheese is grated. 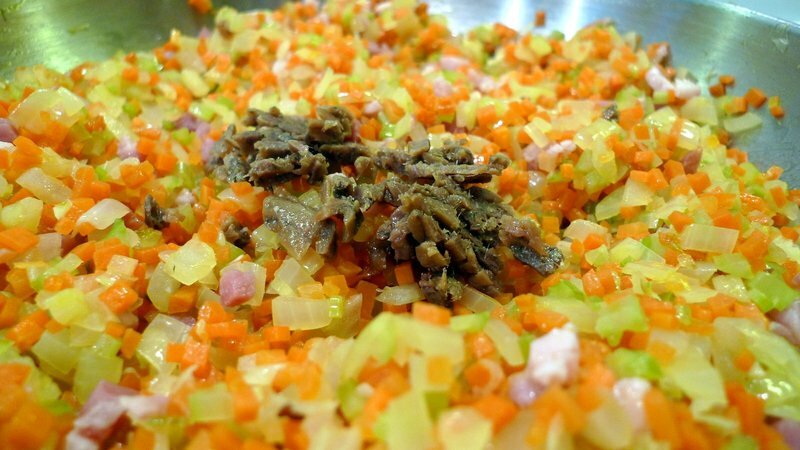 One note on the ragù, you should taste it and adjust the seasoning at this time. 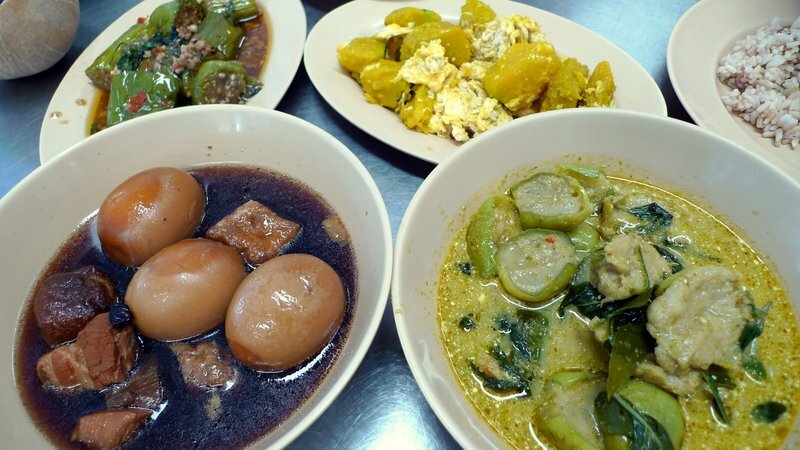 Each component of the dish should taste good by itself if you expect the final dish to taste good. Since my sheets of pasta were varying lengths, I just let them overlap and fold back on themselves as necessary, giving the dish a rustic, authentic look. Unlike what the original recipe said, I think there needs to be a layer of ragù under the first layer of noodles. Simply oiling the dish wasn’t enough to prevent the bottom layer of pasta from sticking. Add some ragù. Doing it again, I would also double the amount of ragù to make it meatier. Then add the Béchamel sauce. The recipe stressed that this does not need to be incorporated into the ragù as they are meant to be two distinct layers. So I just poured it on and left it as is. 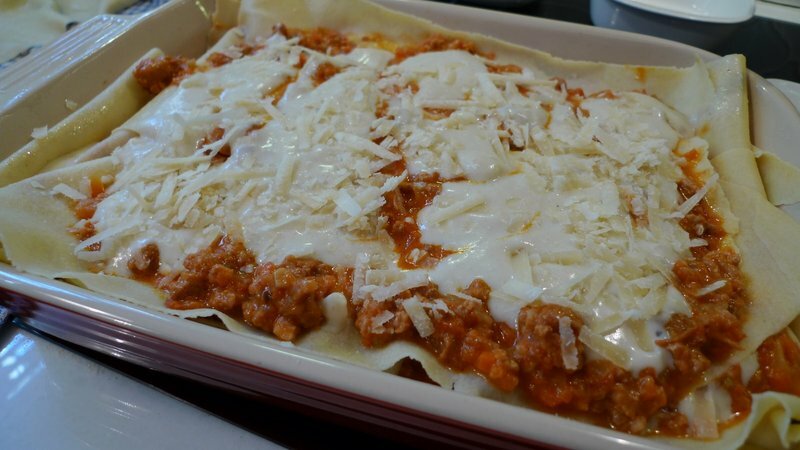 Sprinkle on some Parmesan Reggiano cheese, then continue with the alternating layers of pasta, ragù, Béchamel sauce, and cheese until the dish is full. I made two single portion lasagnas, each with a single long noodle. Cute, huh? They freeze nicely, too. These are covered tightly in foil (oil the piece that is touching the top so it doesn’t stick too badly) and then bake at 180 C / 375 F for about 50 minutes or until the lasagna is bubbling. Remove the foil and cook for another ten minutes until the top is lightly browned. The end result. I removed the foil too early so the pasta edges are a little crisp, which is actually kind of nice. The party guests really enjoyed the lasagna and if pleasing a crowd is a measure of success, then this adventure was well worth the effort. Lessons learned: homemade pasta makes a ton of difference, so I will make it again when doing lasagna. Over time, I’m sure it will be easier for me. 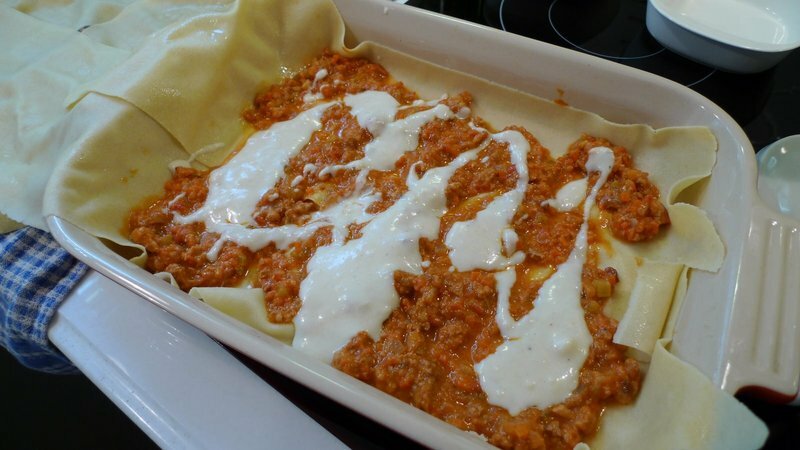 Also, for a richer lasagna, I will double the proportion of ragù to Béchamel sauce. 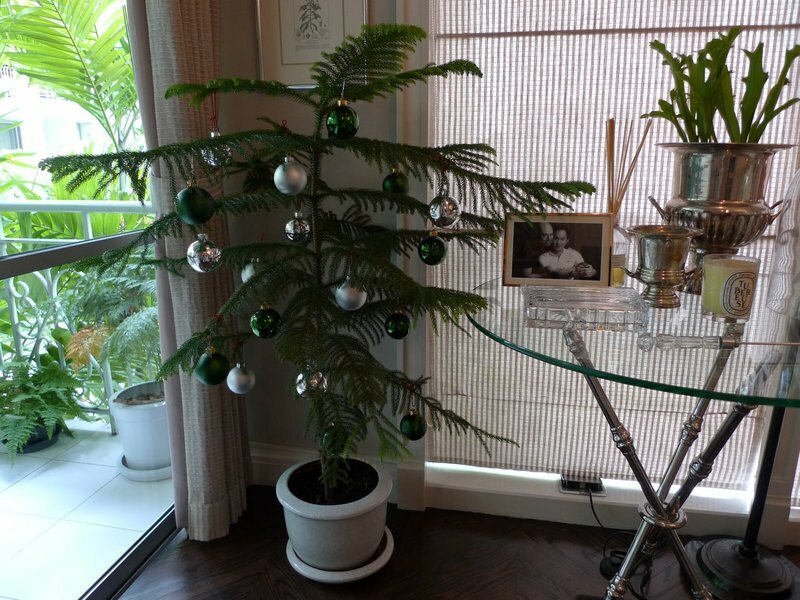 It is a warm and humid Christmas Day here in Thailand. After some extensive cooking for last night’s Christmas Eve party with Tawn’s university friends (I’ll write about that tomorrow – homemade Lasagna Bolognese entirely from scratch! ), I’m back in the kitchen today preparing maple-rosemary candied pecans for my mother-in-law and an apple pie for dessert tonight with American friends. 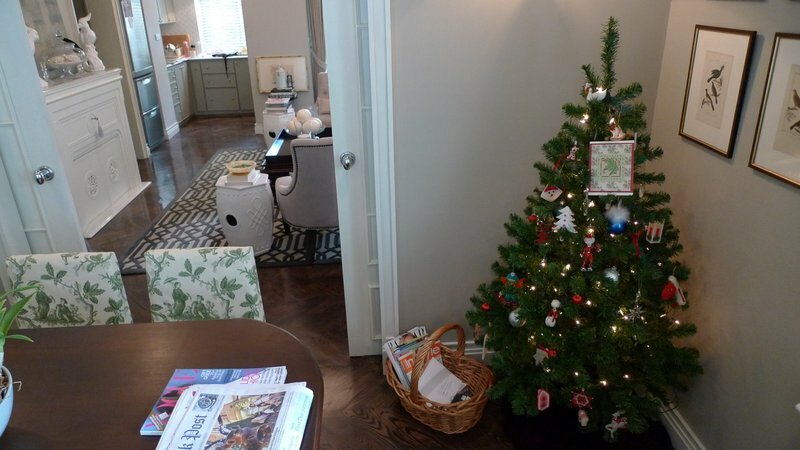 The first tree is a potted one that looks pine-like, brought in for the season and simply decorated. It has spent the last six months resting up by the pool. Seriously, the condo maids felt that it wasn’t getting enough sun on the walkway outside our front door so they spirited it away to the pool deck, tending after it for us. The second tree is an artificial one, pulled out from storage and given a more thorough decorating, graced with dozens of ornaments that hark back to my childhood, many of them handmade by my paternal grandparents. As I type this, some 166 holiday songs are shuffling on my iPod, my current favorite of which is the duet of the Frank Loesser song, Baby, It’s Cold Outside by Glee stars Chris Colfer and Darren Criss. Video here. Granted, it isn’t cold outside, but with the air conditioning on full blast, one can imagine. 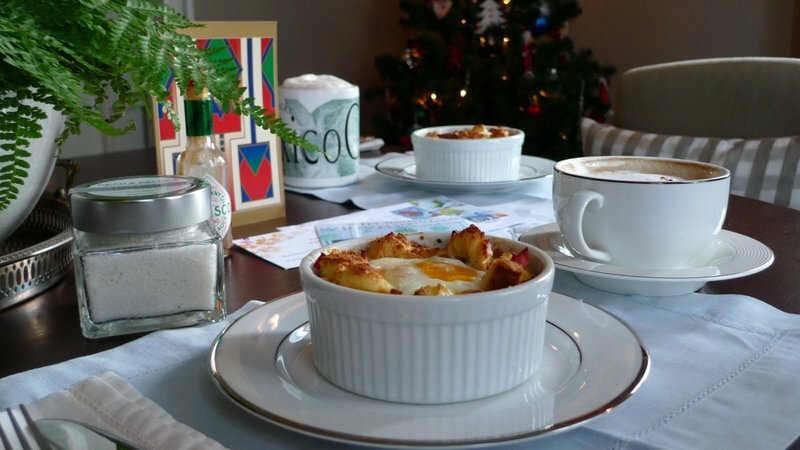 After waking up about 7:30 I prepared a simple Christmas breakfast of baked eggs: stale bread cubes soaked in an egg-milk mixture, tossed with green onions, ham, and mozzarella cheese. After making a well in the bread mixture, I break an egg, sprinkle with salt, and bake for fifteen minutes. This results in a warm and satisfyingly simple breakfast, accompanied by a few dashes of Tabasco sauce and a hot latte. For all of our Christian friends and family members (as well as those who aren’t Christian but who enjoy celebrating Christmas as a secular holiday), we wish you the very warmest greetings and hope you and your loved ones have a happy Christmas and a healthy and peaceful year ahead! 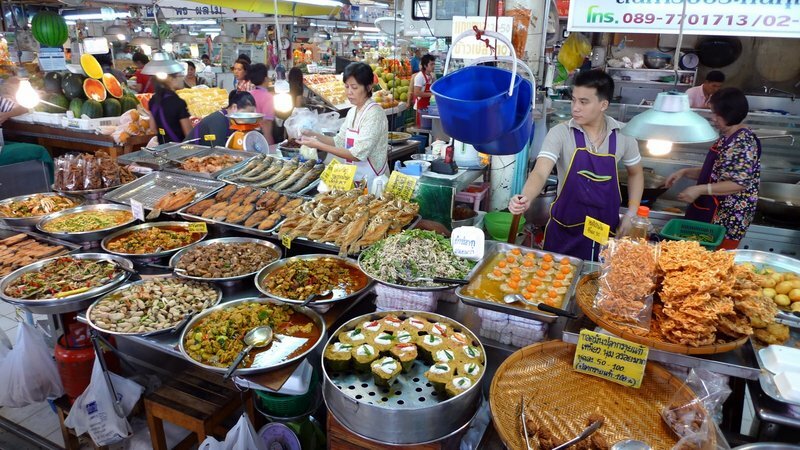 One of the big tourist attractions in Bangkok is the Chatuchak (sometimes “Jatujak” or “JJ”) Weekend Market. Open only on Saturdays and Sundays, this modern-day bazaar features thousands of vendors selling just about everything under the sun. Last weekend we went there with a visiting friend to eat at Foon Talob, the popular fried chicken and green papaya salad restaurant. 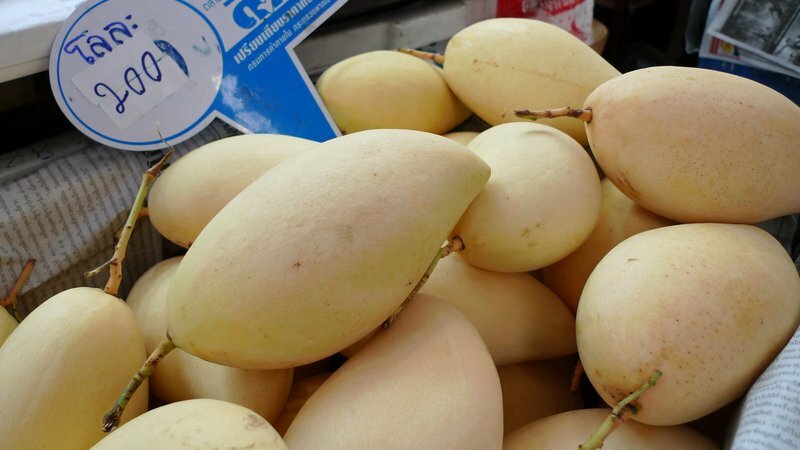 (You can read an entry about Foon Talob here.) Sadly, I think the chicken wasn’t as good as usual, somewhat greasy and soggy. 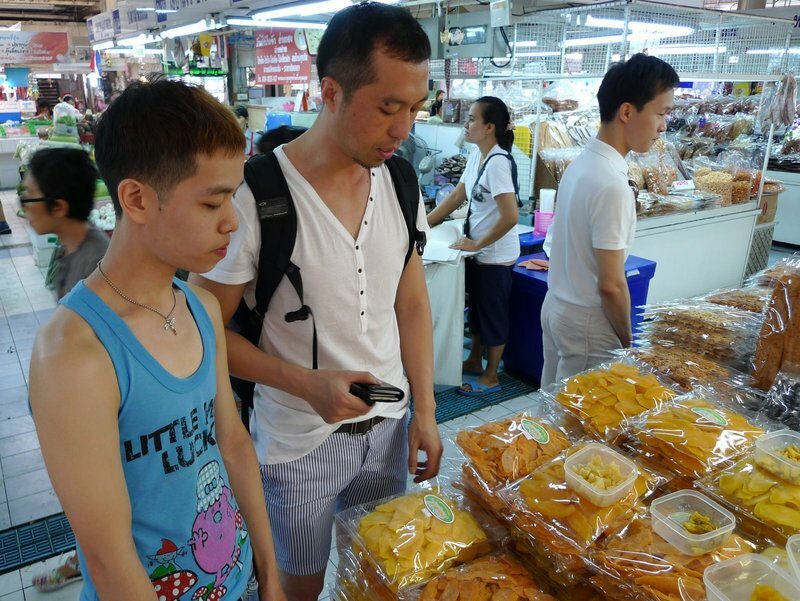 After the chicken, though, we did some shopping – something I almost never get involved in as shopping isn’t my thing and hot, crowded shopping is even less my thing. 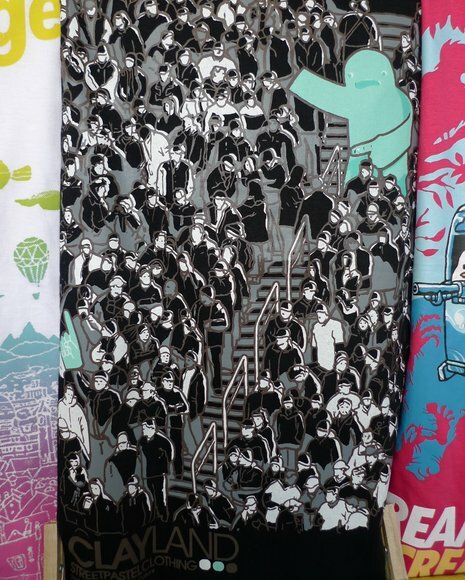 One thing that caught my eye were some of the t-shirt designs available at several shops. I don’t know if all of these are unique to the vendors or if they are bought from some other source. 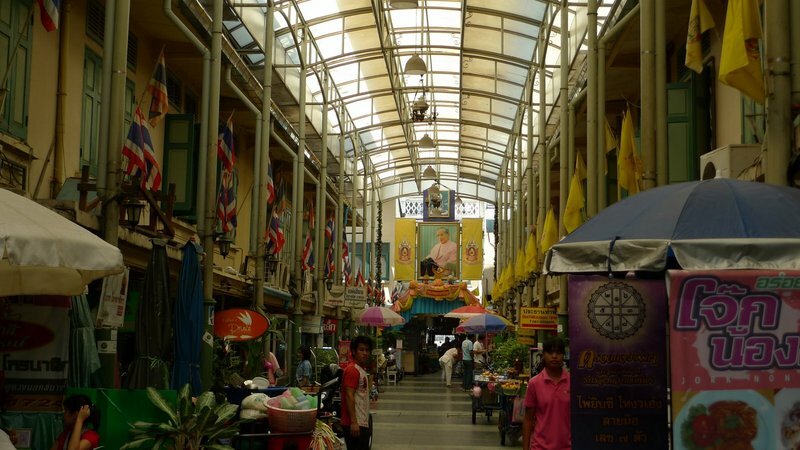 Generally, Chatuchak creates an opportunity for small designers to sell their own merchandise. Sometimes, though, the vendors are simply selling products designed and produced by other people. This one, of a large foam monster seeking his “Number One” hand, made me laugh. 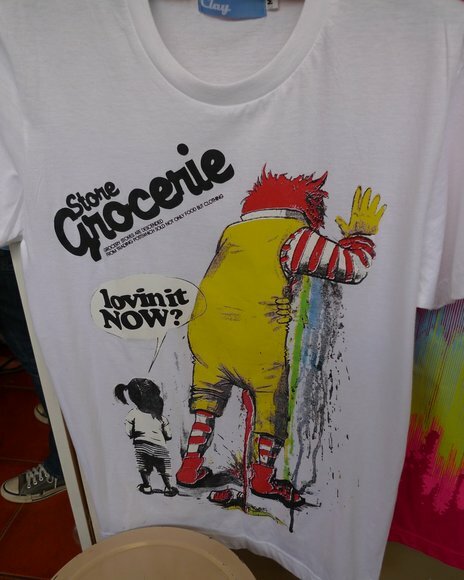 Who thinks of these things? 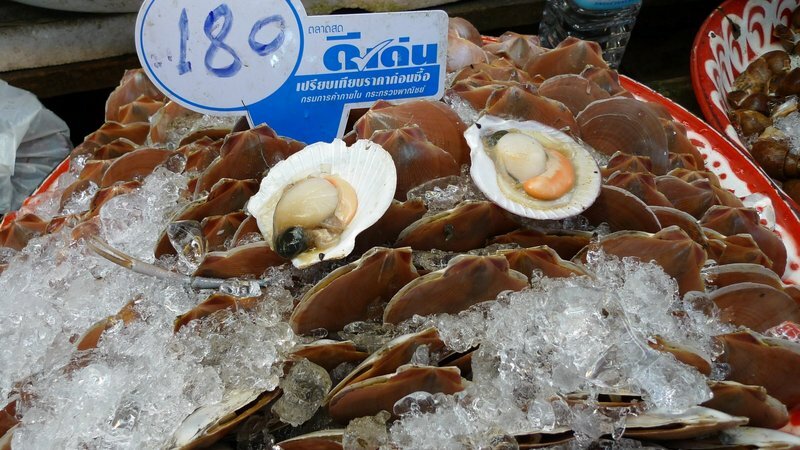 This one I actually bought for 150 baht – about $5. 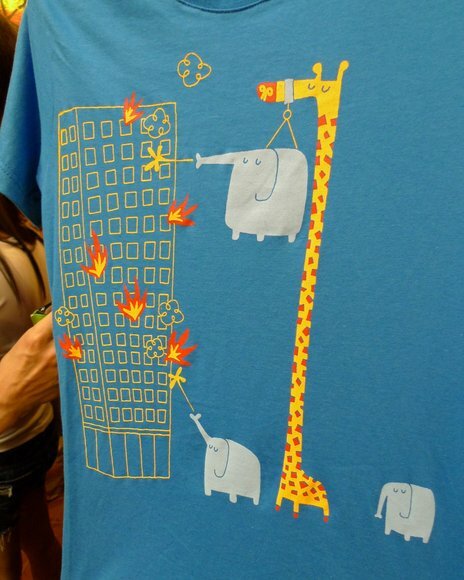 I like the way the elephants are drawn and the idea of using a giraffe to lift the elephant is funny.